After a long winter, every sign of spring is exciting. First it’s the lengthening days and the early-morning chatter of the birds. Then it’s the buds, the bulbs and the green leaves. And finally, the first edible gifts from the earth: fiddleheads, ramps and asparagus. 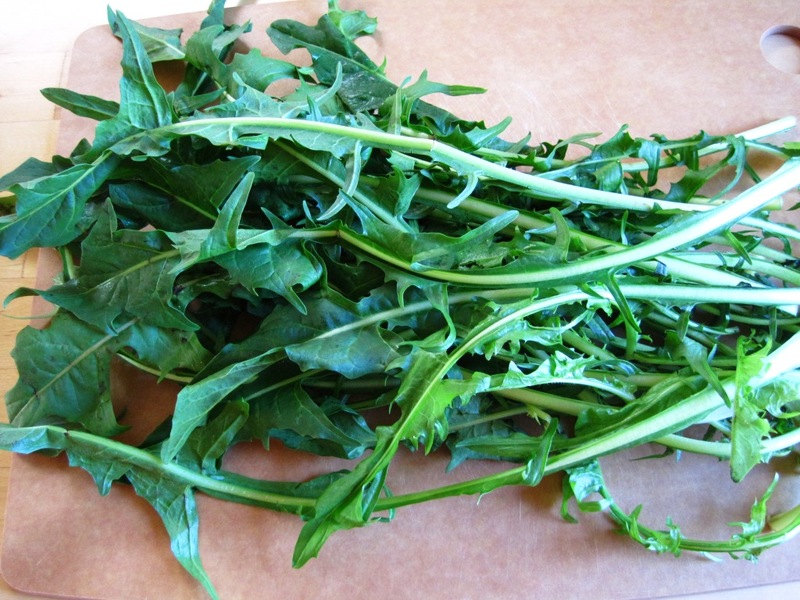 In Switzerland (and probably certain parts of France), I’d add dandelion greens to the list. Last weekend, we bought those four ingredients—admittedly, the dandelion greens were not local, but the asparagus was from Ontario, the ramps and fiddleheads local—and enjoyed a taste of spring for four consecutive days. Dandelion greens on the chopping board. Initially we wanted to make a typical Swiss dandelion salad with a creamy dressing, lardons and egg. Luckily I tasted a leaf and realized the greens would be too tough and bitter for a salad. Instead, I threw them into the pan with the lardons (boar bacon from the Piggy Market), sautéed them until wilted, drizzled with aged apple cider vinegar (from Pierre Gingras in Rougemont, QC), and seasoned with salt and pepper. Served with a soft boiled egg (I have yet to experiment with poaching) and good bread (Beau’s Beer sourdough miche made exclusively for the Piggy Market by Art-Is-In Bakery), it was a simple, satisfying meal. Now I’m wondering: what is the difference between the dandelions proliferating on my lawn and the ones I ate for dinner? 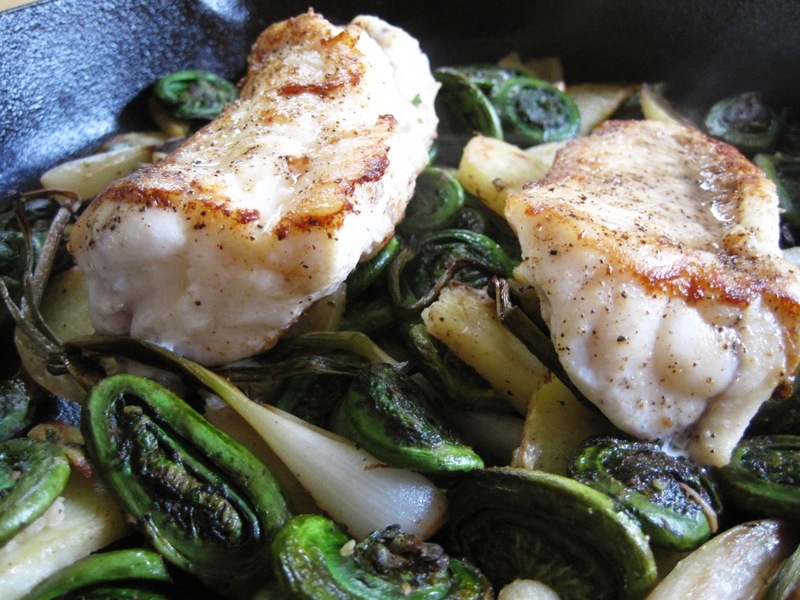 Roast monkfish with fiddleheads, ramps and potatoes in cast iron, served. It had been a *very* long time since I’d cooked with monkfish, so we picked up a piece at a fishmonger and used a recipe from epicurious.com for inspiration. I followed the method, but substituted potatoes, fiddleheads and ramps for the chanterelles, leek and ginger. I also used olive oil, but can see how the clarified butter would add flavour, and deglazed with white wine instead of the vinegar and soya sauce. 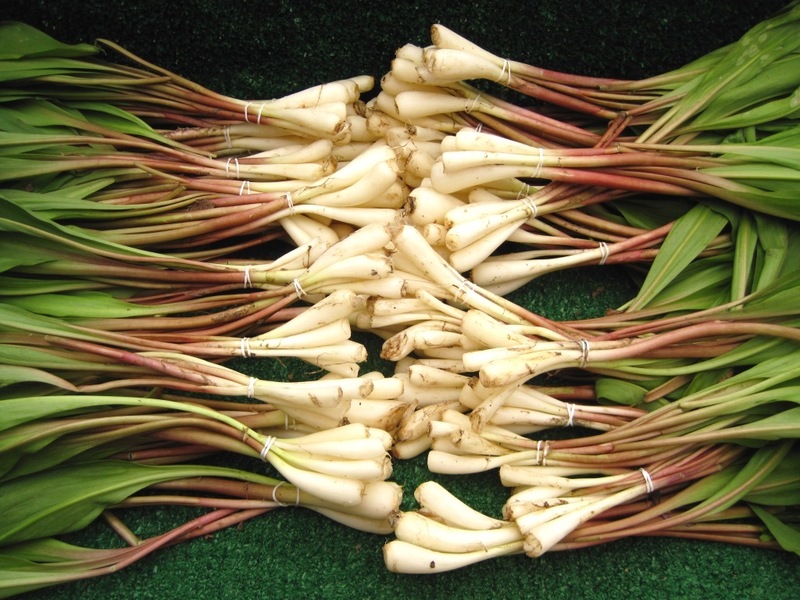 The result was a great tasting cast iron dish—I love cooking in cast iron—the ramps adding a delicate sweetness and mellow onion-y taste. If I did it over, I’d use whole new potatoes and put the ramps in at about halfway through the cooking (the “bulb” part was tender, but the finer stems were crisp and almost burnt). Fresh out of the oven. Next time, I'll spread the filling to the edges for more even browning and leave them in the oven a bit longer. 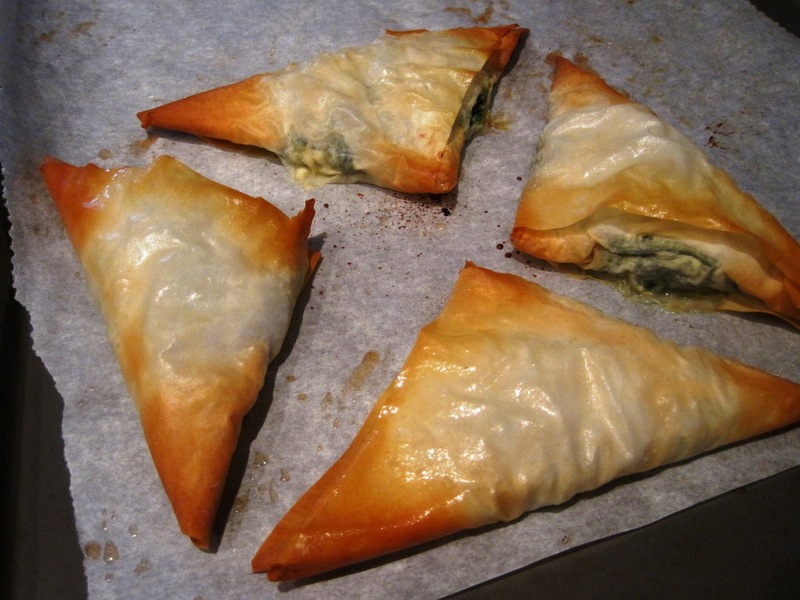 Phyllo sheets, leftover dandelion leaves, spinach and ricotta inspired this dish. It would work with greens like arugula or Swiss chard too. Wash and roughly chop a bunch of spinach and half a bunch of dandelion leaves. Sauté greens with chopped garlic, sliced green onions and Chinese chives, which I happen to have fresh from the garden. (I use high heat until just wilted to avoid drawing water from the leaves; the little water left over from washing creates just enough steam to prevent burning.) Remove from heat and transfer to a bowl. Let cool to warm. Add ¾ cup of ricotta cheese and ½ cup of grated parmesan cheese. Brighten with zest of one lemon. Season with salt and pepper. Cut phyllo sheet lengthwise into three strips. Heap filling at one end of strip, fold into triangle, and place on baking sheet. Brush with melted butter and bake at 350°F for 12-15 minutes. Makes approx. 10 triangles. I find that the lemon zest lifts up the dish by adding a hint of an unexpected, bright and sunshiny flavour to the mixture. I bet this filling would also work for a quiche by adding 1 ½ cups of cream/milk (I use a combination of whatever I have on hand) and 2 eggs (beaten). 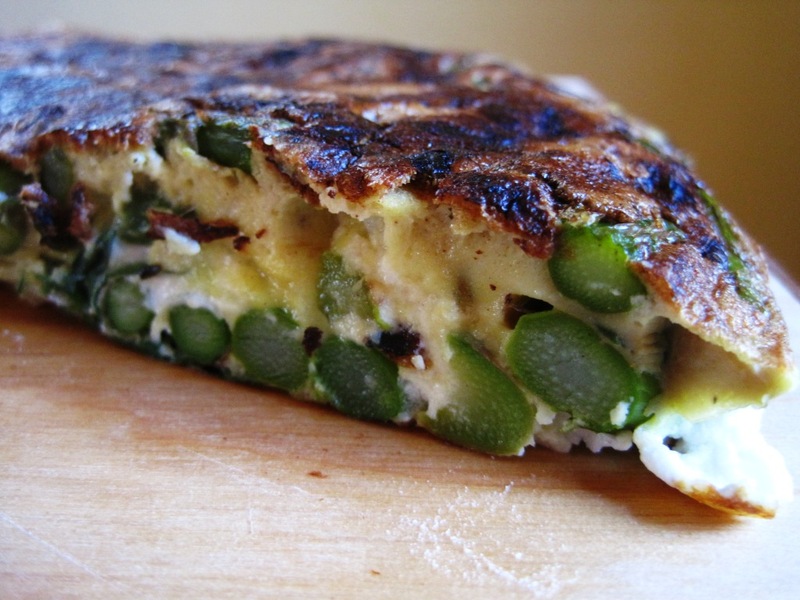 Asparagus, goat cheese and tarragon frittata. Funny how in this piece the asparagus all happen to be lined up along the bottom. Frittatas are among my favourite meals. They are easy and versatile; frittata flavour combination are limited only by the imagination. For this version, crack 8 eggs into a bowl, beat them lightly and season with salt and pepper. Crumble fresh goat cheese (100-150g) into egg mixture and add a bunch of whole tarragon leaves. Cut asparagus into 1-2 inch pieces. Sauté asparagus until just tender—add a bit of water and cover with a lid to create some steam. Pour egg mixture over asparagus; move asparagus pieces around in the egg mixture to distribute evenly. Turn heat to low and allow egg to set (I usually put a lid on the pan). I flip the frittata by sliding it onto a plate once the egg is almost set and flipping it back into the pan—I like colour on both sides—but you could just let it set completely without flipping or (with an oven safe pan) finish it in the oven. Leftovers will make a perfect lunch tomorrow! Hmmm, what to cook on Wednesday? !